Home » Posts tagged "Pre-production Meeting (PPM) of Garments"
Every factory has their own policy to control quality to get a better product. Everything is to be written in a document; how to control quality and how to get the best quality product. For quality control, this document is known as a quality manual, which is followed by each and every company in the apparel industry. A complete quality control manual of garments factory actually increases the effectiveness of quality control by providing guidelines to the related parties. Here in this article, you will find a complete quality control manual of a typical Garments Industry. After reading this, you will have detail idea of a complete quality manual of a garments factory. At first, we need to make styling sample for getting styling approval as per buyer’s specification, fitting & workmanship. Everything we need to follow as original sample & comments. For styling sample, we give fabric & accessories similar to original color or approved lap dip. We, make a paper pattern of sample size as buyer requirement. As per styling sample comments, we make the size set pattern. Size set sample covering all size & covering all size & color. All actual fabric & accessories are used for styling sample. Must adjust the pattern as require fittings, grading, workmanship according to approval specification & comments. For the final configuration of styling fitting & workmanship, before state production we make another size set sample covering all size & color for approval. After receiving p.p sample comments, manufacturer meet all of buyer requirements, then start bulk production. In every step of sampling, we kept a counter sample with marking the sample name. Pre-production sample counter should follow with p.p comments for bulk production. We make the copy of p.p sample with comments to give every line in production. Shipment sample has to prepare for buyer 15 days before shipment covering all size & color with all actual accessories. These requirements very buyer to buyer. we always fulfill our buyer’s requirements. We cut 60 pcs of garments as a 1st trail to see the measurement. If any correction is required then we do it accordingly. For the safety, we again cut 300 pcs of garments as 2nd trail cutting. After full confirmation, we start bulk cutting. A pilot run is a small cut across all sizes & colors that will identify & potential problem in manufacturing prior to the factory cutting bulk. The inspection of the pilot run should be carried out by the factory Quality Control (QC). A new fabric is being introduced and the factory has not handled it before. Machine setting must be reevaluated and set accordingly. New construction methods are being introduced for critical fit tests. New machinery or new settings are being introduced. To ensure that shrinkage allowances built into patterns are corrected for steam shrinkage, washing shrinkage, fusing, printing or any other after treatment to standard. The Pre-production meeting should be held to review all aspects of production. It should be held after PP sample has been approved & sealed. Line managers should attend this meeting which should be facilitated by production head and attended by PP sample maker. The meeting agenda should include style file checklist, production T & A plan, PP sample and comments review and other aspects of the manufacturing run which could impact garments of the manufacturing run which could impact garment Quality and delivery. The factories in-house documentation/from is also acceptable. To ensure that shrinkage allowances built into patterns are correct for seam shrinkage, washing shrinkage, fusing, printing, or any other after treatment to standard. Repeat order of same season without any change, no need to attend PPM repeat order with changes PPMs need to attend. Repeat order of previous season (no change) need to have pp reference review. We inspect 1.5 AQL/10% of accessories as per packing list quantity, by store Q.I we use quality manual. Q.I checks the accessories quality & safety issue. And write down the information about quality, safety issue & short excess quantity. For that, we can take an effective action from the very beginning. For every style, it is washed or non-washed, we make a blanket to see the fabric shade & variation of color. We mark rejected roll on that one, which is out of color standard. We divide the toll as per shade wise to ensuring shade wise cutting. To find or all shade from bulk fabric for shade band making. Shade band to be made base on the outcome of shade blanket. 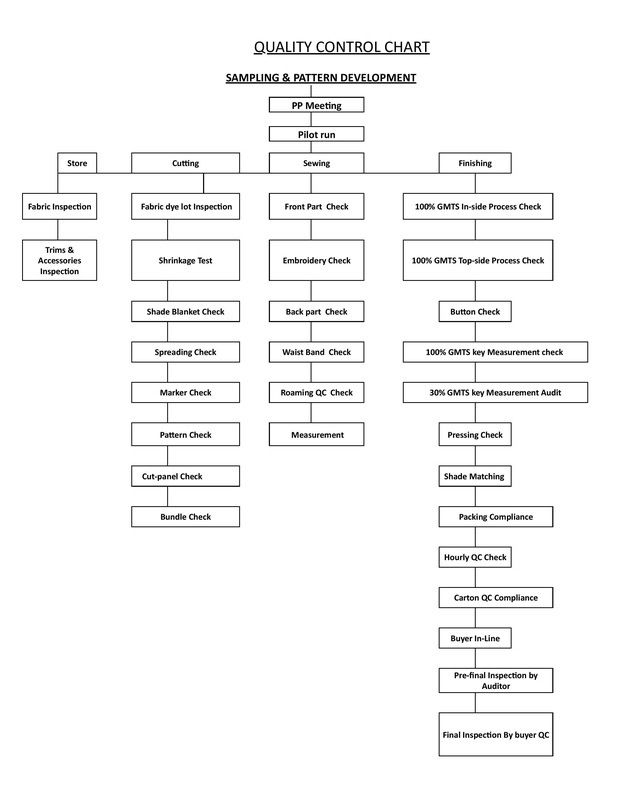 To set up an acceptable shade range for factory bulk production guideline. To find out off shade & solve a problem at the earlier stage before bulk production. Shade band must be submitted before bulk production is started. Each shade let made two set of leg panels for buyer approval. Whenever the handstand/Ppspray effects are presented in the standard, they should be demonstrated on one side of the leg panels. To determinate bulk fabric shrinkage for paper pattern adjustment to ensure washed garment measurement meet with the size space. To determinate whether the fabric shrinkage fulfills buyer requirement at the earlier stage before bulk production. Shrinkage & Distortion testing could proceed with the same template at the same time with the same yardage. For normal fabric, minimum 10% of bulk fabric is being tested. For low stretchability fabric, minimum 30% of bulk fabric to be tested. Please refer to the purchase order to determine bulk fabric is high stretchability fabric or not. Specimen for testing to be selected for each dyeing lot. 100% test when shrinkage in bulk fabric is unstable. Such as part of fabrics shrinkage exceed the tolerance, shrinkage range is too wide in the same lot of bulk fabric. Specimen for testing must be fully relaxed before marking. Mark two 50 cm x 50 cm squares (Minimum) on specimen’s left, right. Specimens must be washed as bulk production; no ironing /pressing/steaming on the washed specimen for shrinkage test result. Placement of Marker: Check and verify so that the marker is sited on the range with the brink matching to the selvage of the piece goods. Also, you need to Confirm that all cut pieces will be finished properly. Shading: A control system should have for checking of shading if all parts are ply marked. Table Marks: Table is be marked so check the table marks and please do not allow any splices. Markers: Make sure that there are no makers with creased or overlapped parts in the markers. Splices: After spreading is finished then check the splice laps that both plies extend past the marked splice by less than 1/2 (half) inch and not more than 1 (one) inch. Narrow Goods: After completion of the spread, check the “far edge” of the spread to see that all plies extend beyond the marker line. Count: Check the count after completion of spreading, and before cutting. Count all plies at both ends. There is no tolerance. Leaning: Check carefully to ensure that one edge of the fabric is square to the tabletop. Visually inspect the alignment of the edge with the table top. Record spreading defects by the number of defects found for each checkpoint. For fabric utilization purposes, the sample form includes columns for edging end and remnants. Calculate the defect rate for the spreader by dividing the number of defects found by the height. Cutting: The quality control inspector should check each cutter at a 2.5 acceptable Quality Level (A.Q.L) based on the number of parts being cut. Matching: Plies check the top ply with the bottom ply. Compare both to a hard pattern or the paper marker Comparison to a hard pattern is best. Tolerance is +- 1/8”. Report each defect found to the cutting foreman(supervisor). Rugged Cutting: Check for rugged cutting according to the standards for your product. This a judgment defect. It is more important on critical parts if the part has to be recut, it is a defect. Notches: Check the notch location by placing the pattern over the top ply. Tolerance is +- 1/8″ If the botch is more than 1/8″ off. Contact the cutting foreman (supervisor). Pattern Check: Compare the pattern to maker paper to ensure that the maker was correct. Record cutting defects on a cutting quality control form along with the number of bundles examined. To calculate the defect rate for cutting, divide the total defects found by the number of bundles checked. Often changes are made to patterns to adjust for production problems. Some suppliers note such changes on the pattern and/or maker for the cutter to correct. Do not allow such a policy. Preventive measures are the best control for quality. Make a new pattern with the correction. We follow root canal system in sewing. For that, we analyze the source & reason of defects and take preventive action as per the root cause. Q.I checks 100% incomplete garments of quality control manual. Q.I writes the operator name & I.D in the format and make that, how many defects she has done in one hour and then one day. And this daily total result is added for monthly summarization for the quality evaluation process. The hourly defects record is very important for root cause analysis. If anyone of Q.C sees the hourly record, he can easily imagine that what is going on & what have to do? End line Q.I checks 100% garments. Q.I writes down the name & ID no of operators & keeps an hourly record of defects. So that we can easily identify the most defective operation and take preventive immediate action. We compare both reports of inline & end line to see the efficiency of Q.C, either he is doing proper work or doing homework. An in-house audit is another station audit done by line Q.C we do that for the more safety. When comes first output, Q.C check the styling & the statistical audit to find out any mistake which has done in sewing. In finishing a section, finishing Q.C will again do the statistical audit for find out any error, which has done in finishing section. For that, we can solve any problem from the very beginning. After receiving from wash we start finishing the procedure, at the same time we press covering all size & color to see the measurement, wash standard, hand fill & any wash defect by wash factory. Also, carton & poly, measurement ensure by the first production. Trimming is a most important thing of quality issue. For that, we establish a trimming section to strictly control the uncut thread. We don’t allow tread end over 3 mm. We should take care of trimming throughout the stitching process. Final trimming is done in the finishing area before packing. A large quantity of Q.I recon check 100% garments, process-wise in the side of garments. They ensure that no defect & uncut thread inside of the garments. For every Q.I give their personal Q.C pass number inside of the pocket. For removing the loose thread & number sticker garments we use thread shaking machine.100% garments go finishing area through the thread shaking action. In finishing section Q.I person check 100% garments, process-wise top side of garments. They ensure that no defect & uncut top side of the garments. For that every Q.I give their personal Q.C pass no inside of the pocket. We have a gas steam boiler for clean ironing. We use the iron shoe to avoid the shining mark. For the perfection, we press a garment two time. One is called preliminary pressing & another is called repressing. This has after final & getup checking. After preliminary pressing Q.I person check topside of whole garments. They ensure that no defect, spot & uncut thread top side of the garments. For that every Q.I give their personal Q.C pass no inside of the pocket. 100% garments should a measurement check before packing. Measurement defects garments should not advance for packing. Defect means out of tolerance, if it can rectify, it will be pack otherwise it will be count as a reject. Q.I check there is something odd looking at a glance in whole garments, like out of shape, spot, poor pressing and mainly checks any missing of a hand tag price tag, and size tag. And match the barcode number, bar, wording everything with the approval trim card. Re-pressing is needed to recovering the damage by Q.C handling. We do this for an attractive outlook. There is no perfection to enter any okay garments without metal detector machine checking. We sent all okay garments to packing section through metal detector machine. Packing section is isolated by gatekeeper system. Our detection standard is 1.0 mm diameter sphere of ferrous metal. We keep 100% record of metal detection. Before seal, the carton Q.C check the ratio & garments shade that, the ratio & garments shade is as per buyer requirement & same shade in one carton. If both thinks are okay Q.C give a sign inside of carton, then the carton should seal in front of Q.C. There is an in-house pre-final audit for self-confirmation, done by the chief quality controller. He audits by 2.5 A. Q.L as receiving the Q.C pass report we offer for final inspection. Our A.Q.L chart is shown as bellow. Hopefully, after reading this you already understand that how you can maintain a better-quality control. 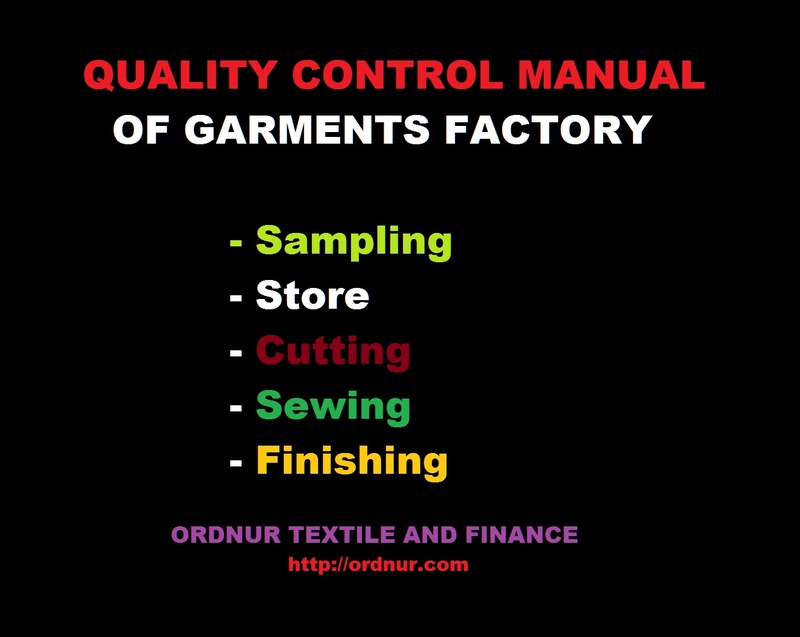 If you follow this type of manual and make your own manual for each section of your garments factory then it will be easy for you to ensure a quality production. If you need more guidelines regarding this then please do not hesitate to ask, our comment section is always open for your opinion.